My girlfriends joined me for food and conversation at our girls’ night last night. I had a great time preparing for the evening. Being on a fiscal diet as well as a physical one means I had to think outside the dinnerware when devising a knock-out tablescape. I’m pretty pleased with what I came up with. I used inexpensive lime, yellow and pink paper plates and cocktail napkins to set the color theme. I offset the lime and yellow napkins with the plates, alternating the colors. 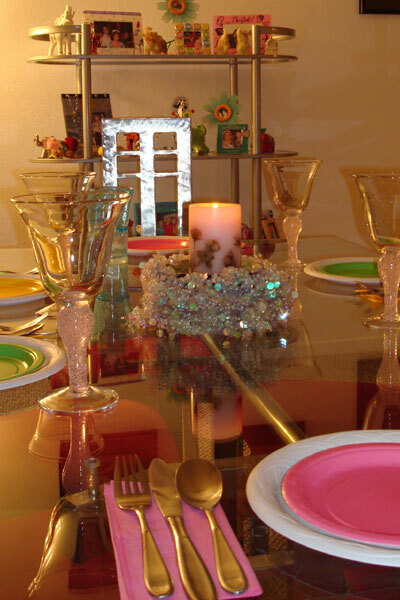 Then, I mixed & matched turquoise and pink bubble glasses at the place settings. 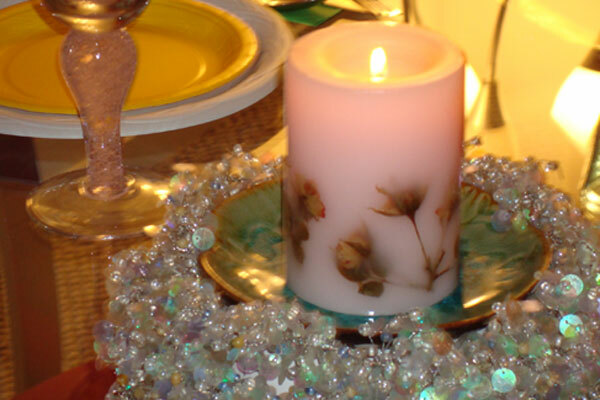 I even improvised a centerpiece using an overturned small casserole dish, shiny mother-of-pearl holiday garland, a decorative turquoise dessert plate and a feminine rose-accented candle. The fun didn’t stop there! I created two clean eating recipes for the party: guacamole and a subtly spiced rice pudding. I don’t have nutrition stats, but here are the yum-o-licious recipes! Cut avocados in half, remove pit and flesh from peel. Dice the avocado into uniform chunks. Place diced avocado in blender with pico de gallo and almond milk. Add seasoning and blend again. Heat the evaporated milk and almond milk in a heavy saucepot until it comes to a simmer. Add the sugar-free syrup and Pumpkin Pie spice, both to taste, and stir to blend. Add the cooked rice and heat through. Simmer it until it thickens. Remove from heat and allow to cool. The rice will continue to absorb the milk as it cools. Serve warm or chilled, topped with a swirl of fat-free Reddi-wip. Entry filed under: clean eating, recipes. Tags: budget decorating, dinner party, eat clean recipes, girls night.